Buy onyx autoflowering cannabis seeds from dope-seeds.com. Onyx is a tall, big yielding auto strain with AK47, White Russian and Diesel in its genetic makeup. Onyx was our first ‘Next Generation’ Auto strain and its amazing yields and quality continue to make it one of our best sellers. Onyx has a very interesting genetic background which contributes to its extra height and potency. The Shortstuff Breeders who created Onyx tell us: “Onyx is a secret stabilized plant which includes AK47 x White Russian and diesel, but many more…This plant is quite tall, between 60 to 100cm tall, very branchy, fruity taste, very good producer… This strain is going to be a legend and could be the most worked auto strain ever, result of the biggest selection from crosses we have ever done!” The introduction of Diesel gives Onyx a wonderful stinky aroma and the AK47 guarantees that knock out stone you have come to expect from the classic serious seeds strain. The White Russian contributes with tons of THC crystals and a very tight flower structure meaning each bud from an Onyx plant really carries some weight. 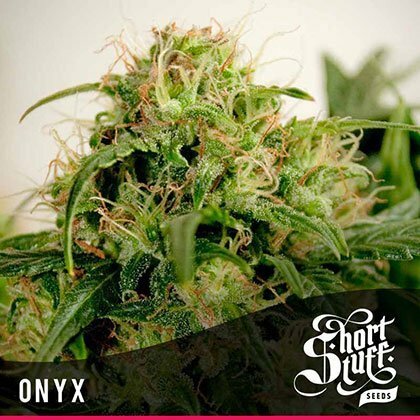 Onyx is one of our ‘Next generation’ Mid-sized autoflowering strains which means that while it retains the auto flowering characteristics of the original lowryder style strains, and will go from seed to bud in around 70 days, it is a much more potent, fast growing, taller strain and can easily match traditional photo-period cannabis strains.